An increase in 2010 Silver Proof Eagles and record-approaching 2011 Silver Bullion Eagles are the most interesting aspects in the latest US Mint sales report. The Proof Eagle coins have seen two weekly adjustments since they sold out in late December. The latest brings them up 3,644 to 860,000, which would seem like a natural stopping point. Collectors will have to wait until the July time frame for the 2011 Silver Proof Eagles to make their appearance, according to the US Mint. 2011 bullion eagles launched on January 3, 2011. Silver Eagles already have last year’s January record in their sight. The coins have raced to 3,407,000 in less than two weeks after their latest weekly pick-up of 1,322,000. Until January 2009, the silver coins had never topped the 3 million mark during the first month of a year. Those record sales totaling 3,592,500 may get clobbered in mere days. The all-time monthly high of 4,260,000 which was just set in November could be the next victim. As a side note, the 3,407,000 sold this month includes 469,500 of the 2010-dated issues. The US Mint had buyers order one 2010 Silver Eagle for every five of the 2011’s. Bullion one-ounce 2011 Gold Eagles are running, but not sprinting like their silver counterparts. US Mint sales has their tally at 42,500 for a weekly increase of 29,000. As a comparison, buyers ordered 85,000 in January 2009. Inventory of the 2010-dated coins also remains. There were 53,000 at the start of the year. US Mint Authorized Purchasers must order one old for every four of the new ones. *The as of date for the American Eagle bullion products is January 12. 53,000 of the 2010-dated 1 oz Gold Eagles remained for sell this year, and buyers must order one of them for every four of a newly dated issue. The sales figures also include 469,500 of the 2010-dated Silver Eagle coins sold in January. 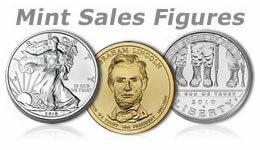 The collector coin sales figures above have an "as of date" of January 9, 2011. Please, someone with the 2010 Gold Eagle mintage figures, clue me in as to the final mintages !